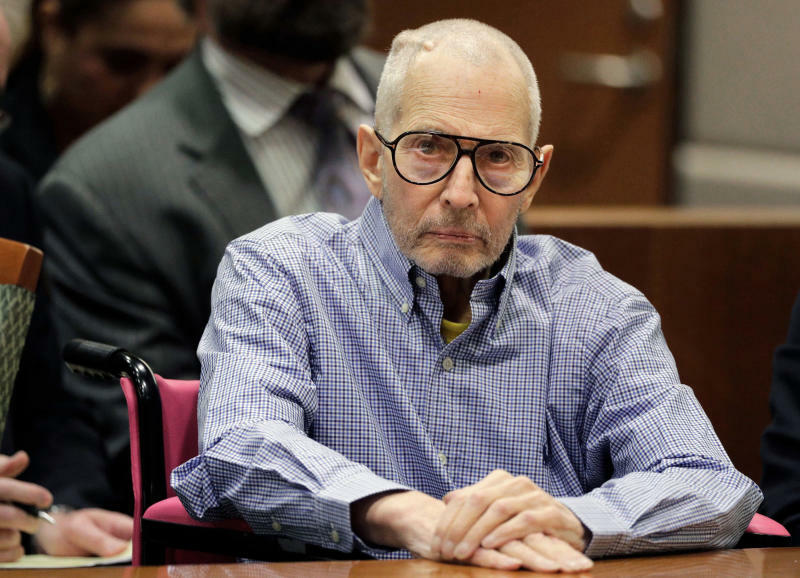 NEW YORK (AP) — The legal saga surrounding real estate scion Robert Durst found yet another venue Friday, as a new lawsuit accused him of killing his first wife in New York and disposing of her body in 1982. The wrongful death claim, filed in state court, came two years after a judge declared Kathleen Durst legally dead. It accuses Durst of killing the woman in their suburban New York City home after she threatened to divorce him. Durst for decades has denied involvement in his first wife's death. But the lawsuit claims he has made "multiple admissions" to the killing, including remarks featured in a sensational HBO documentary that examined Kathleen Durst's disappearance and two other killings for which Durst was charged. During the finale of that series, "The Jinx: The Life and Deaths of Robert Durst," he was heard muttering to himself on a live microphone: "You're caught! What the hell did I do? Killed them all, of course." Durst, 75, was arrested in New Orleans in March 2015, just hours before the airing of the final episode. He has not been charged in his first wife's disappearance but is scheduled to stand trial later this year in Los Angeles in the killing of Susan Berman, his best friend and spokeswoman. Durst allegedly told her about his role in his first wife's death and then fatally shot Berman in 2000 after the authorities in New York reopened their investigation and planned to talk with her. Prosecutors say he ambushed Berman in her home near Beverly Hills and shot her in the back of the head. Phone and email messages were left with Durst's lawyer seeking comment. An attorney for Kathleen Durst's sister declined to comment. The lawsuit filed Friday differs from a prior legal action brought by Kathleen Durst's sisters accusing Robert Durst of interfering with the family's efforts to recover the woman's body. The wrongful death claim, which seeks damages, alleges that there is "overwhelming evidence" Durst abused his wife before her disappearance, citing a host of possible motives for her killing. It alleges that Durst's "modus operandi lends itself to the conclusion that Kathie (Durst) was shot in the back of her head and that her body was cut into little pieces and her remains were then disposed of." The filing refers to another killing for which Durst was acquitted of murder in Texas in 2003 after testifying he fatally shot a neighbor in self-defense before dismembering the man's body and tossing it out to sea. Durst, who inherited a fortune from his family's New York City real estate empire, had gone into hiding in Galveston disguised as a mute woman living in a low-rent apartment. Prosecutors claimed Durst killed the neighbor, Morris Black, to prevent him from revealing his whereabouts.